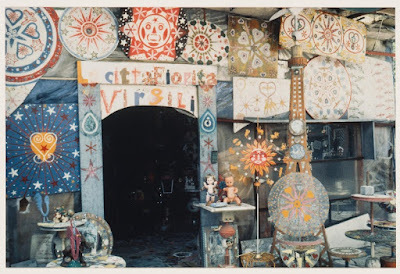 Josué Virgili (1901-1999) ¹, who created this site, migrated in 1922 from Italy to France where he worked as a marble mason, first in Monaco and later -from 1932 on- in the Paris region. He liked to write poetry and other texts in Italian and he somehow considered himself a messenger of god with the mission to spread love and brotherhood. 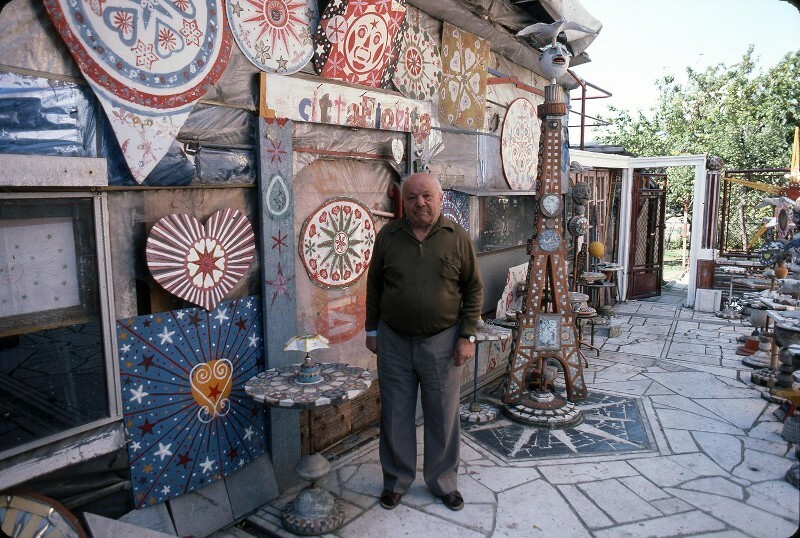 When retired, around 1970 he began transforming exterior and interior of his house in Kremlin-Bicêtre into an art environment. His artistic production in particular consists of a large variety of colorful small-scale objects that almost completely cover floors and walls, such as self-made dolls, vases, small sculptures and other objects, often displayed on a variety of equally self-made pedestals and small tables. 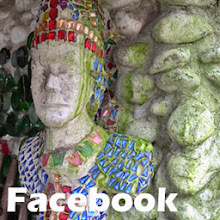 For some creations cement was used and these are often inlaid with pieces of mirror glass, marble or faience, like most exterior and interior floors were also decorated with mosaic in various patterns. 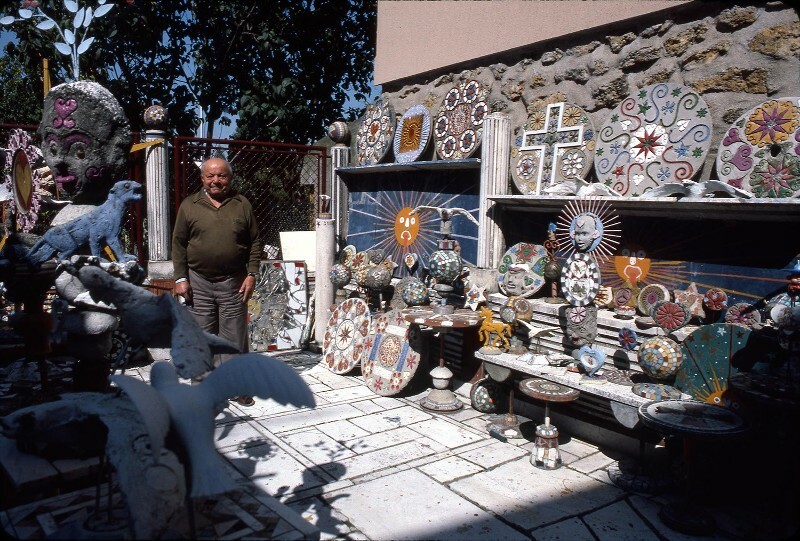 A rather special and characteristic part of Virgili's art includes a series of all kinds of circular creations, often decorated with mosaics or colorfully painted, which evoke associations with or symbolize the sun. The exterior had various totems, poles with doves or weather vanes on top and other structures such as a towery one as in above picture that is reminiscent of the Eiffel tower. 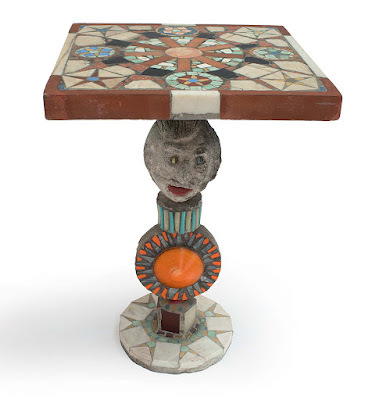 The picture below, from the website of the ABCD-art brut collection, showing a pedestal/table made by Virgili, gives a good impression of the way Virgili decorated his creations with mosaic and small concrete structures. 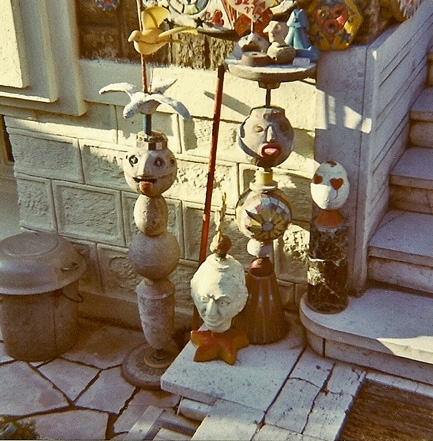 Sculpted heads similar to the one that can be seen in the table leg, return in various other table legs and totems that are part of this art environment, as can be seen in the photo by Bruno Montpied below. 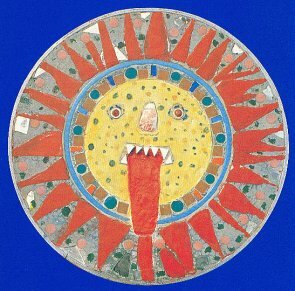 Also rather interesting is the story around Virgili's creation pictured below, a shining sun that has an accompanying inscription, saying LA RACINE fait pousser (the root makes grow). Virgili's art environment doesn't exist anymore. The small items generally are preserved, and have ended up at art dealers, in the collection of l'Aracine or other private collections. The mosaics and similar decorations on walls and floors probably have gone lost. Great to hear about the Lille Art Museum new website. Thank you once again for your very thorough documentation. YOUR blog is a treasure!